NEARLY 10,000 barangays across the country have been declared free from illegal drugs since 2016 when the government started its crackdown on narcotics, the Philippine Drug Enforcement Agency (PDEA) said Friday, January 25. 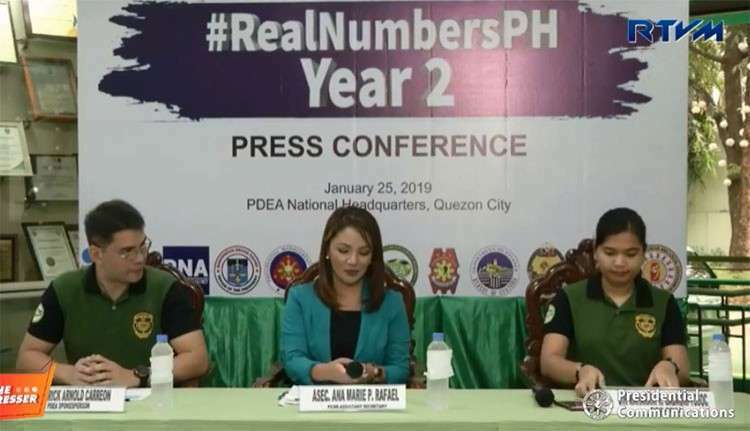 In its #RealNumbersPH press conference, the PDEA said a total of 9,999 barangays are already cleared of illegal drugs from July 1, 2016 to December 31, 2018. Drug-cleared villages are those once affected by illegal drugs but cleared due to the programs and intervention of the government. There were a total of 42,044 barangays in the country. Of the figure, the PDEA said a total of 9,618 barangays have never been affected by illegal drugs, while 22,427 or 53.34 percent are still affected. Government records also showed that from July 2016 to December 2018, a total of 5,104 suspected drug personalities were killed in 117,385 illegal drug operations, while 167,135 were arrested. Among those arrested were 621 government employees who were allegedly engaged in illegal drug transactions. The government also said that in 2018 alone, the crackdown on illegal drugs has resulted in the seizure of over P25 billion worth of illegal drugs and laboratory equipment for illegal drugs manufacturing.